If you’ve not already read our previous article on the downfall of Irish Whiskey you might want to do so before continuing. Where the previous post covers the tragic cataclysm for Irish whiskies fall from the pinnacle and spotlight of the global whiskey stage by conspiracy of politics, dedication to the craft (some might say stubbornness) and technological innovation to a historic low in the 1970’s, today’s post celebrates Saint Patrick’s and the rise again of Irish Whiskey. In 1978 when the Coleraine grain distillery closed its doors for the last time Ireland was left with a handful of brands but only two distilleries, one producing malt, the other producing grain whiskey, both were part of a single company the Irish Distillers Group. Single malt production was centred in Northern Ireland within the Bushmills distillery, (registered in 1784 but claiming lineage back to 1608) and the New Midleton Distillery which produces such iconic brands as Jameson, Powers, Midleton, Redbreast, Tullamore Dew and Green Spot distilling both grain whiskey and Single Pot Still Irish Whiskey (made in part using unmalted barley). Then in 1987 John Teeling converted the state owned potato schnapps distillery in Louth into a whiskey distillery founding Cooley Distillery Public Limited Company. Cooley distillery, the first Irish distillery founded in over a hundred years adopted the more traditionally Scottish distillation approach for its range. Both the Connemara and Tyrconnell ranges being double rather than triple distilled as favoured by the larger Irish brands. The approach was a clear success allowing the opening, or re-opening of Locke’s distillery in County Westmeath . Founded in 1757 and closed in 1925 Locke’s had been converted in a whiskey museum by the local community, but in 2007 (the distilleries 250th anniversary) it was acquired by Cooley Distillery PLC and refurbished. 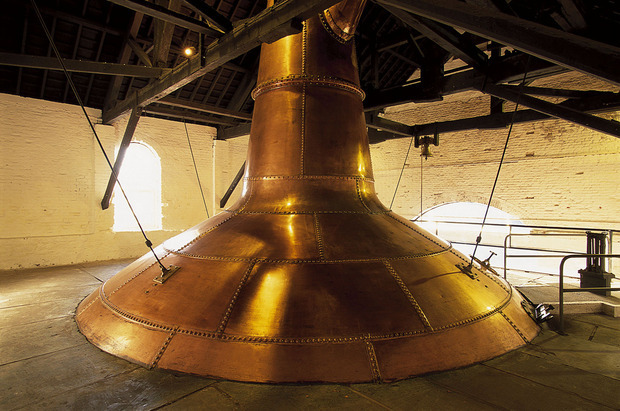 The newly opened Kilbeggan distillery became fully operational in 2010 with the installation of a mash tun and fermentation vats, and interestingly what is reported to be the worlds oldest working pot still. It would not be unfair to say that Cooley distillery has helped change the perception of Irish whisky on the global stage, as the distillery has taken some 300 awards most notably becoming the first Irish distiller to earn the International Wine and Spirit Competition (IWSC) accolade “Distillery of the Year” in 2008. However the founding of Cooley was only the beginning of an upward surge for Irish whiskey. 1988 saw Pernod Ricard acquire the Irish Distillers, this perhaps more than any other changed the landscape of Irish whiskey. This sudden access to the giants distribution network saw the groups exports rise by 13% within the year. While the centring of so many brands might have seen even further reductions in variety with only a core few being supported Pernod Ricard drove the opposite direction distributing the Irish brands. Jameson was transferred to Ricard, Bushmills was adopted by Pernod while champagne specialists Besserat de Bellefon tok charge of Powers. Paddy was granted to Sovedi and Tullamore Dew was transferred to Cusenier. This redistribution each with its own specialist teams saw a diversification of marketing strategy and resulted in a wider array of expressions being crafted. Diagio entered Ireland in 2005 with its purchase of Bushmills and 2011 saw Beam, Inc which produces Jim Beam acquire Cooley Distillery and it’s brands (Beam Inc is now owned by Japans Suntory). While the arrival of so many foreign owned groups has not been universally popular, and it has closed the door for many smaller suppliers, their championing of the traditional Irish Single Pot Still whisky, their advancement of aged blends and the drive in popularity of triple distilled whiskies has dramatically changed the market.